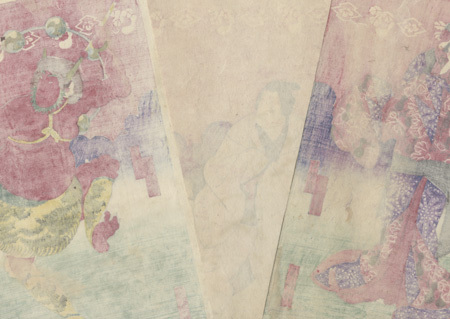 Comments - Rare, six-panel kabuki scene of two triptychs3 featuring figures set against a colorful background with a red sky with a white border of gourds and motifs running across the top, and blue-violet clouds shaded to white and green. 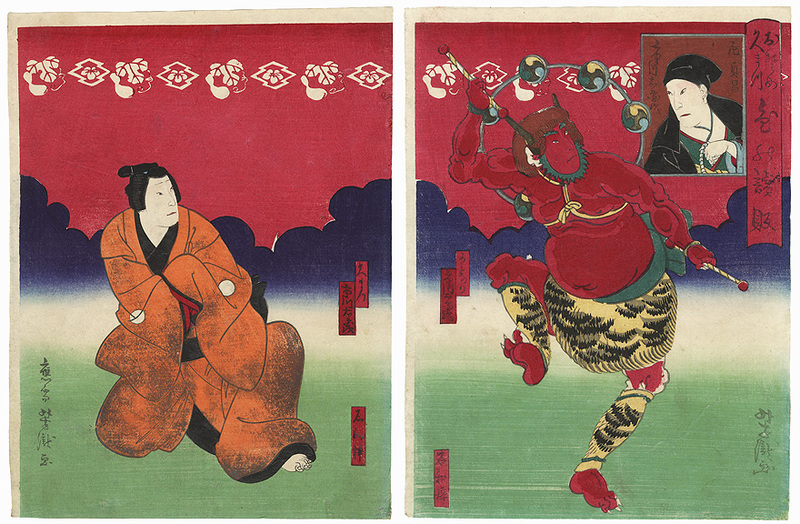 The figure at right is the Thunder God Raijin, hopping on one foot and waving his drumstick, a ring of small drums encircling his head. A rectangular inset next to him shows a monk with prayer beads. Nicely detailed with lacquer on the black obi and black kimono trim. Condition - This print with excellent color and detail as shown. Six separate panels, one backed with paper. Slight soiling. Please see photos for details. Good overall.